Shown during the signing of the agreement are (from left): Associate Director Bryan David and Managing Director David Young, representing Colliers International; Insular Life Vice President and Real Property Division Head Hector A. Caunan; and Managing Director Michael McCullough and Vice President for Business Development Yves Luehti, representing KMC MAG Group. 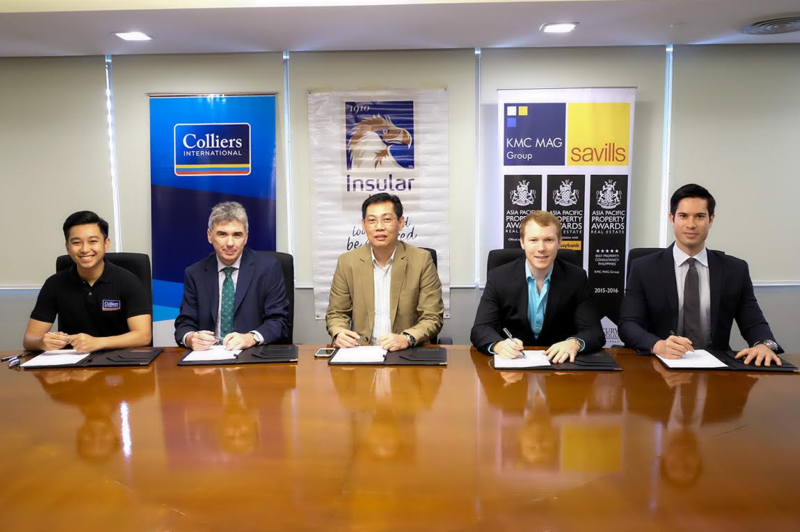 Insular Life signed an agreement with Colliers International and KMC MAG Group for the co-landlord representation of the new Insular Life Building in Makati City. As co-Landlord Representatives, the two companies will be responsible for the pre-selection of tenants for the new Insular Life Makati Building, which is undergoing renovation, and will be completed by February 2017. Insular Life is also building a 5-storey car park building behind its main building.